Providing an intensive one-with-one guided process designed to shift your thinking and help you prioritize your top goals and objectives to achieve the results you desire. Professional, business and leadership development offerings based in scientific theory and supported by business application. Sessions are scheduled at your convenience and can take place by telephone, video conferencing, or in person in Las Vegas. To explore if this is the right process at the right time for you, contact Dr. Goeglein to request a pre-meeting questionnaire. Dr. Goeglein holds a Master’s in HROD, a PhD in Organizational Psychology, and advanced training in Positive Psychology. Goeglein is a business founder who is academically trained and uses that training to guide the success of others. Transitioning from senior leadership positions in the military to leadership positions in the civilian sector is a major life shift. Andrea’s expertise and guidance can make sure you ‘shift’ in the best direction. Andrea is called Dr. Success for a reason. She has an uncanny ability to get to the heart of the subject and provide a structure towards achieving your goal. 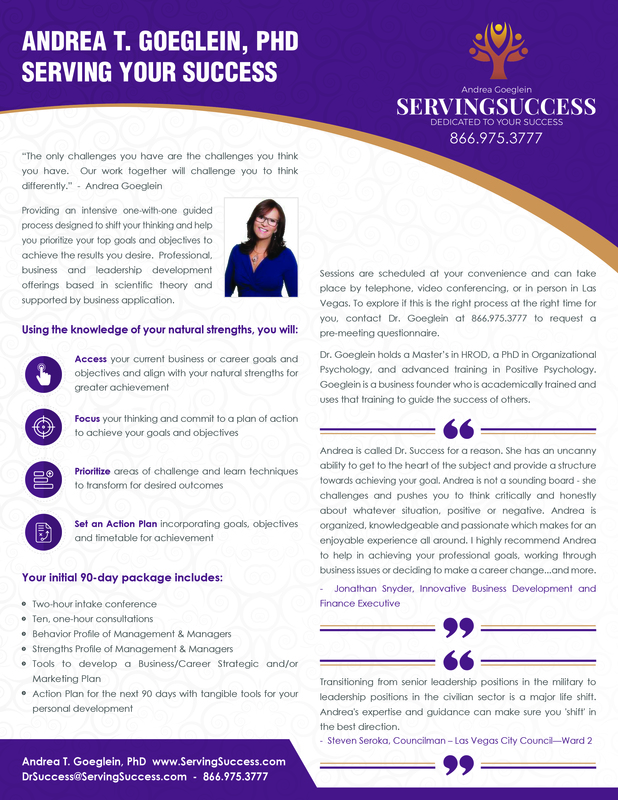 Andrea is not a sounding board – she challenges and pushes you to think critically and honestly about whatever situation, positive or negative. Andrea is organized, knowledgeable and passionate which makes for an enjoyable experience all around. I highly recommend Andrea to help in achieving your professional goals, working through business issues or deciding to make a career change…and more.